You are here: Home / About the Canal / How Does a Lock Work? 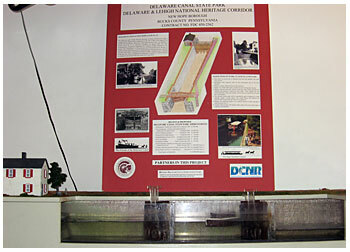 Palisades students created a 3D model of a canal lock. 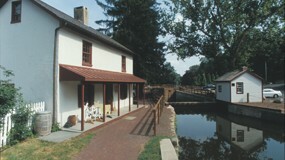 Visit our headquarters at the Locktender’s House in New Hope to see a working model of a canal lock. This newest addition to our exhibits was created by five students in the Design and Manufacturing class of the Academy at Palisades High School in Kintnersville. These students were guided by teacher Ray Kaminski in designing and constructing the 6-foot-long model, complete with re-circulating water. Bonnie Tobin, Delaware Canal State Park educator, advised the class, and the Bureau of State Parks assisted with the cost of the model. 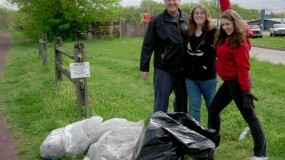 The students did a wonderful job, paying great attention to detail. They located correctly scaled sticks to build the mule pen, and picked out the right shade of red paint for the Locktender’s House trim. They even met the significant challenge of making the model watertight. “Lock through” scale models of wooden canal boats. Just how does a lock work, anyway? If the lock is empty, the lower miter gates are closed. The lock is then filled with water by opening the wickets (rotating valves) in the bottom section of the upper gates. When the lock is full, the upper miter gates are opened, and the canal boat enters. The wickets in the upper gates are shut, and the upper miter gates are fully closed. The wickets in the lower gate are opened, and the level of the water in the lock is dropped until it is the same as the water level below the lock. When the water levels match, the lower miter gates are opened and the canal boat is pulled out of the lock and continues on its southward journey. If the lock is full, the wickets (rotating valves) in the bottom section of the lower miter gates are opened, and the water level in the lock is dropped until it is the same as the water level below the lock. When the water levels match, the lower miter gates are opened, and the boat is pulled into the lock. The wickets in the lower miter gates are shut, and the lower miter gates are fully closed. The wickets in the upper miter gates are opened, and the lock is filled until the water level in the lock is the same as the water level above the lock. When the water levels match, the upper miter gates are opened and the canal boat is pulled out of the lock and continues on its northward journey.